Garage Door Market Data — Zoller Consulting Inc.
Do you know the size of your market? We can craft a customized data report on most areas of the Garage Door market. Contact us and we will give you a quote. We specialize in providing detailed Market Data to Dealers and Manufacturers. Our reports four page reports feature 27 different categories of information for each MSA*. Segmented Market Demand Reports reflect the annual market potential in each industry segment. 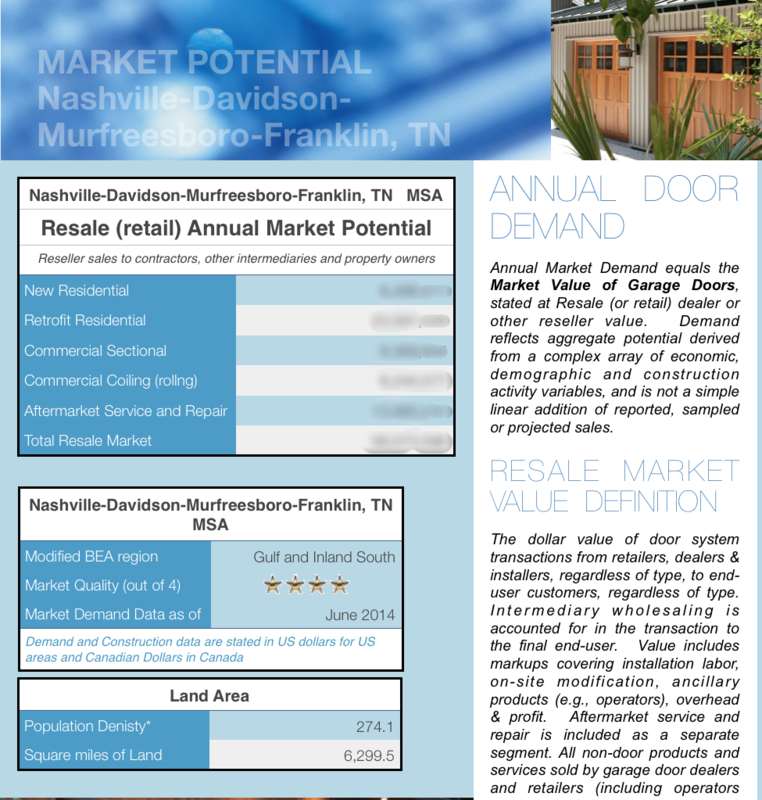 Sample page from Garage Door MArket Report. Ready to find you Market report? Enter the City State or MSA in the search window above, or navigate to the state with the Market Snapshot tab. Looking for a customized report on any door related data? We have an extensive database of information, spanning many years, from which we can construct a custom report to fit your needs. Contact us to let us know what you are looking for and we will provide you with a quote for your project. We license a full Version scale Zdoorz that contains market Demand numbers for all 495 MSA's and 900 Three Digit Zip Codes across the US. We provide both Wholesale and Resale levels of available Demand dollars stratified by market segment. These segments include. New Residential, Retrofit Residential, Commercial Sectional, Commercial Rolling, Aftermarket and Service and both Wholesale and Retail Total Market Demand Dollars available in each market area. We also have market demand numbers for Canadian Provinces and CMA's.